It’s been an exciting week of new initiatives added to our regular teaching routine. We’ve participated in environmental outreach, toured a national landmark, and taught to a (MUCH) larger audience. Last Friday (June 7th), we participated in some environmental awareness activities with students at the Sophia Training Centre. We planted some trees and shrubs and helped collect garbage around the classrooms and compound. It was so wonderful to see students passionate about the environment! Although the day’s activities were not directly health-related, it was a healthy activity for a few hours and was a great way to bond with the students! Kaieteur Falls – As seen from the air plane! Kate and Kevin joined us in Georgetown for an exciting weekend. We taught at our usual youth space in Rasville on Saturday, and prepared for an adventurous Sunday. As Sundays are our only days off from teaching and working in youth spaces, we took advantage of the opportunity to visit one of Guyana’s most iconic sights; Kaieteur Falls. We took a small plane out of the city, over acres and acres of dense rainforest and winding rivers, to Kaiteur National Park. On foot, we had a tour guide lead us to several vantage points of the infamous falls. It was absolutely breathtaking! The pristine wilderness surrounding the falls, is just as beautiful as the falls themselves. We now understand why Guyana is known as the “Land of Many Waters”! It was an amazing experience to get to see such natural beauty and have some quality time together with all six of us. Allie, Kate, Haily, Adam, Kevin and Janet at the top of the falls! Another exciting recent opportunity has been teaching on live national television! Reyaz Hussein, administrator of one of the schools in which we teach, invited us onto his morning show on NTN (National Television Network). We appeared briefly last week introducing our organization and what we are doing in Georgetown, and this week we taught half hour sessions live on both Monday and Wednesday morning. Luckily, Kate and Kevin were still in Georgetown on Monday morning and were able to join us for our first experience of teaching live on the air. We focused on nutrition, hygiene and physical fitness in our first lesson, and then covered substances in our second. 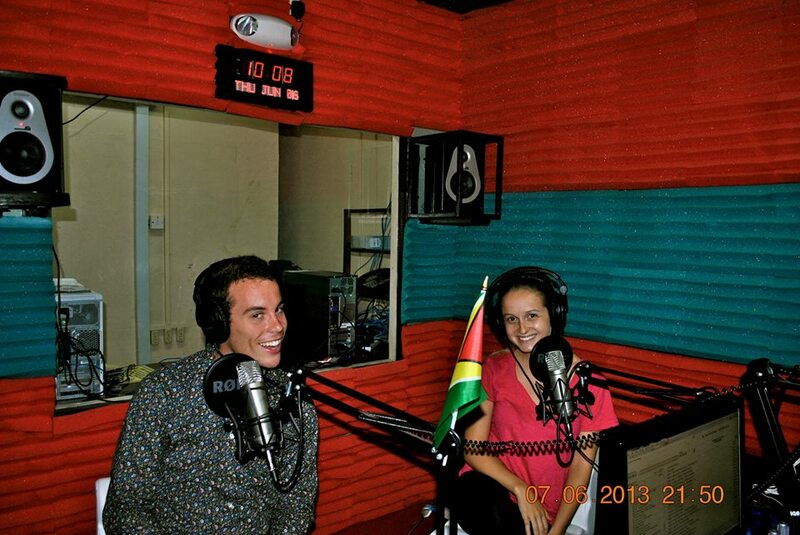 It has been such a different yet incredible experience, and we are so excited to be returning to teach on the show once a week for the rest of our time in Guyana (a total of 5 episodes!). Not only is it exciting for our students to recognize us on TV (“we saw you on the tv miss/sir!”), it is such a valuable opportunity to reach out to a greater audience. In addition to television, we have also been interviewed on various NTN radio programs, raising awareness of health-related issues and the work that we are doing in Guyana. We were excited to have such positive feedback from listeners and viewers; their recognition of the value in health education has increased our motivation in these last few weeks. We are now entering our last week of teaching, and are busy planning review games and sentimental goodbyes. It’s going to be a busy and emotional few days, but we are fortunate to have had this incredible experience that will be so hard to say goodbye to.